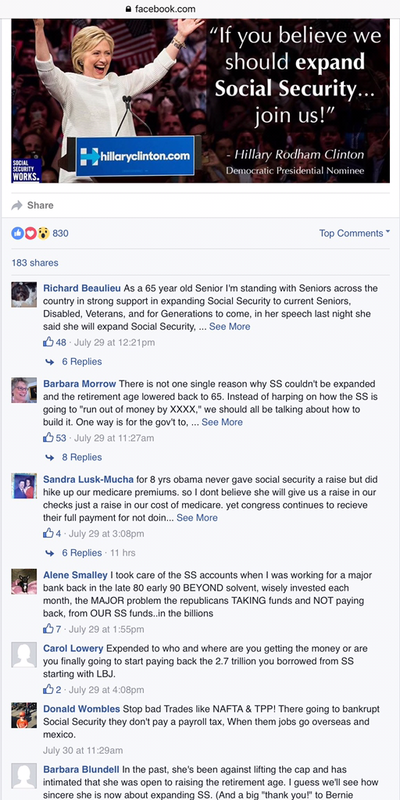 Some surveys show that 70% of Americans support expanding Social Security and they don’t even know what that means or how it will be paid for or how assuring the solvency of the program as it is will be accomplished. Old Bernie Sander’s likes to use words like disgusting, outrageous and unconscionable. I think that about uninformed, greedy citizens, especially senior citizens. Take a look at the Facebook posts below. This is from the SocialSecurityWorks page. I would have replied to these people, but I can’t because the tolerant left sponsoring the organization has blocked me from any comments. We have paid in to SS all our working lives with FICA taxes. That was our insurance for our retirement. What was left over after the current generation was to be invested wisely so that interest compounded until we got there. But LBJ moved it into his general funds and Congress saw a pot of gold. They started spending what wasn’t theirs. Now we hear that it may go broke in a few years. We want them to pay back the 50+ years they stole our money with interest. We don’t really care if it comes out of their salary. The FICA tax was not set up as a Poker Pot for them to use on things other than for families. Rep. Lance just stopped another dipping into the pot this past Spring. They were going to take a few million out for some other project. That fund was set up to be an independent program. Not for roads, buildings, waterways, research, oil companies etc. It was for spouses, Retirees, and families. I have Read the law as it was written. It has had several changes. Now not being able to speak English should NOT be a reason for SS Disability. They are not disabled. And that fund is almost dry. Hillary will not see to the changes either. If anyone believes her, there is a bridge in Arizona they can buy. It used to be in England. What you are saying is totally inaccurate. The SS trust money in excess of that needed to pay benefits has always been invested in US Treasury Bonds that pay interest to the trust. $98 billion in interest last year. A portion of that interest is used today to pay benefits. Since 2010 there has been no surplus in income and no more bonds are being purchased. All the bonds will be redeemed by 2034 unless Congress acts to fix the problem. No, not totally inaccurate. By investing the money in Treasuries, and by running federal deficits, the money isn’t invested in any productive way, it becomes money taxpayers owe … to themselves. Just as we have seen in states like Illinois, Louisiana, New Jersey and elsewhere, when it comes to funding pension benefits for public employees, it becomes a choice between contributions to pension trusts and spending on other government needs. I call this “pensions or potholes”. Do we fulfill our commitments to public employees (no matter how outrageous they are) or do we fill the potholes? But, he turned out not to be correct. Social Security is an entitlement not a contract right. So, when we were paying those “contributions” all of our working lives, there was no certainty that we would receive the promised benefit. Similarly, while not the intended result, as politicians continue to buy votes by pumping benefits today and justifying them by using future tax revenues, they will effectively scrap the system – likely in favor of a hybrid welfare program. – Funding Medicare part A through new taxes added by PPACA. We are on the path to doing it with new benefits that D’s want to promise that will not be financed by increases in “contributions”. So, as Social Security’s contribution-benefit link continues to deteriorate, we will lose public support for a self-financing plan and devolve into some sort of a stupid, vote-buying “fairness” argument. My life expectancy (race, gender) is less, so … my monthly benefit should be more. I had caregiving duties during my working years (gender) and my benefit is less, so… my benefit should be adjusted up. I didn’t have a good public education, so, my earnings were negatively impacted, so … there should be a higher minimum benefit that is not limited by the number of years I contributed. My comment is simply that when the bill comes due, when those bonds must be redeemed, when interest rates on public debts like the Treasuries held in the trust funds rise, we will see just what the commitment is … or whether there will be a scramble to turn this into a welfare program based on “need”, “fairness” – or what we can borrow from future generations, or, horrors, what today’s American taxpayers can “afford”. I wonder if these senior citizens were socialists all their lives and got everything for free. Reading some of these posts it is obvious to me that they never worked a day in their life. They must have sat around in a free house getting free food and getting pay rises every year for doing nothing. I wonder how they paid their bills. Did they check somebody else to pay for them? They must have free electric and gas too. Where do I sign up? So if the current baby boomers want everything for nothing, I wonder what the millennials will want in 40 years since they already want everything and to start out as company presidents. Aw, quit your bellyaching! Just think, if we give old people more money, they will … want even more! Those who give excuses for the president note that taxpayers (and Republicans) take it out of context. They tell us that our president wanted to remind us that government had a hand in building roads and bridges, and in creating the internet. I say, OK President Obama. Maybe so. But, … who the hell do you think paid the taxes to fund that government. It wasn’t some welfare weenie. It was ME – working for wages every one of the past 48 years. I PAID for those bridges. I PAID for those roads. I PAID for the government services that “created” the internet. I FUNDED the department of defense, the state of Ohio, the county of Cuyahoga, and other government agencies. Yes, I PAID for all that, too! And when I was called, I wore the green for a couple of years during the Vietnam Era. Where was your sacrifice Hillary, Bill, Barack? Stop taking more, and more and more of my money in taxes to buy votes. The federal government’s appetite for a larger share of the wealth of its citizens will continue to grow. A limiting factor is the departure of wealthy citizens to countries like Switzerland. Great Britain has contributed to other countries many of its wealthy citizens who were eager to escape higher tax rates. …Costa Rica seems to pop up in these kinds of conversations.